Aww thank you, how sweet of you! I can't wait to see it! Hey everyone! This is my first digital banner! Looking good, I love the warm and tropical colors. Thank you for replying! And thanks for the compliment! I would suggest making the text have a bit of a larger size and contrast so that its easier to read. Other than that, I really liked the theme you guys went with. Combining the sprites with the overlayed background was a nice effect! Bloom, you have an amazing avatar and signature! I really love how you went with the Pokemon style! Here's a new banner for me! I decided to go with what really depicted Ho-Oh and I. You: No Ho-Oh and Lugia? I'm shocked! Me: I know, I know... hey, check out the avatar! Heh heh? That is an excellent banner! I am curious as to how you did the starry background. Did you use a stock image to adjust the color selection? Either way, the contrast has done an adequate job of making it pop out. Loving the borders too. (08-06-2015, 12:08 PM)Raikou Wrote: That is an excellent banner! I am curious as to how you did the starry background. Did you use a stock image to adjust the color selection? Either way, the contrast has done an adequate job of making it pop out. Loving the borders too. 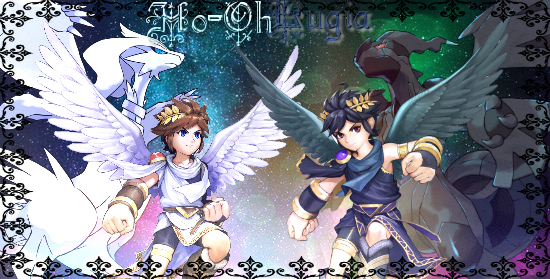 Well, actually, I had used a stock image that Ho-Oh sent me of Aurora, but it was too dark, so I used an editing website (Pixlr Express) to add some effects to make it brighter. Then, I inserted the images and border, and went on Cooltext.com to customize the text. I know the 'Lugia' part of the text doesn't contrast very well, but I wanted it to mach the 'dark' characters.